California – Let's Go RVing! Today was a different day for us. 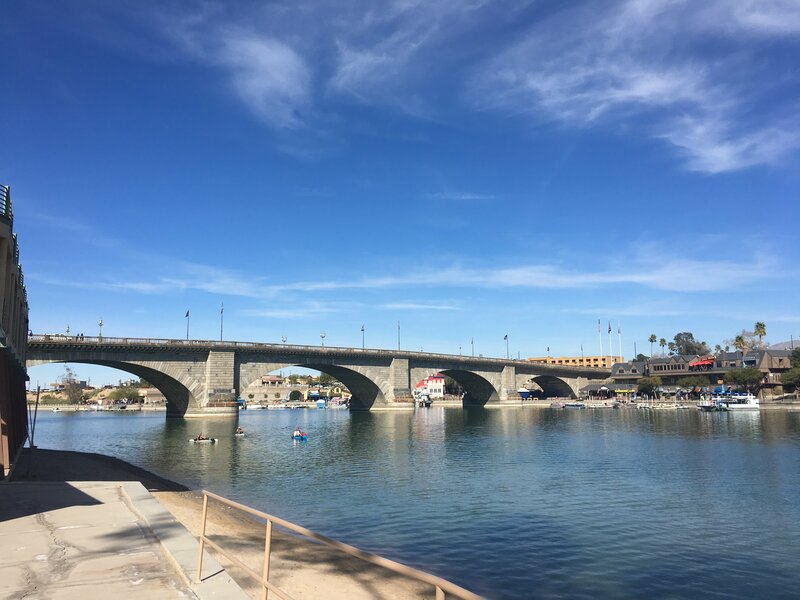 Instead of getting up and hitting the trail we were heading to Lake Havasu City and the London Bridge. Before we left though we ended up outside the coach visiting with our neighbors, Roger and Norma, a lovely couple from California. We talked about the possibility of us going on to Williams and the Grand Canyon tomorrow and they suggested Trailer Village RV right outside of the park. I later called and made reservations for tomorrow night. 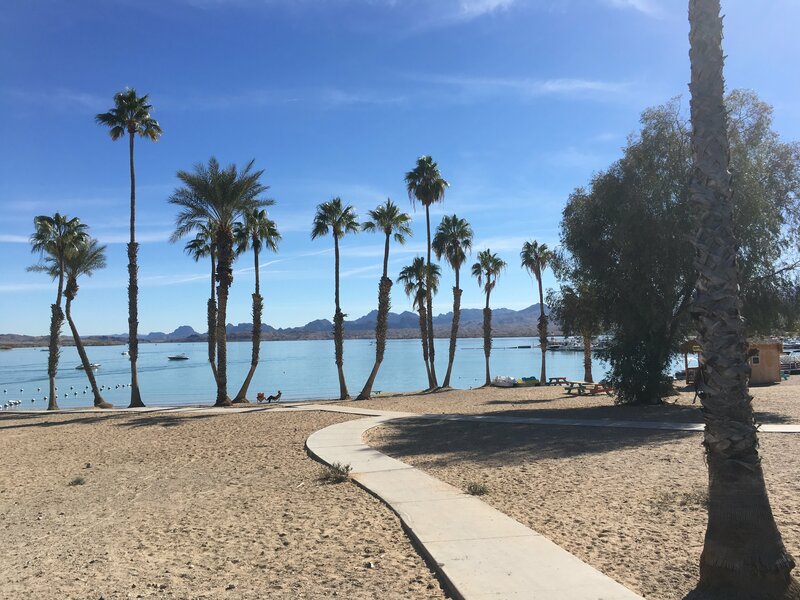 The drive to Lake Havasu City is about an hour long through part of the Mojave Desert. Entering into the city one can immediately tell it is a busy city catering to the snowbirds and there were a lot of them there. We saw a gazillion motor homes and there was no shortage of RV parks. Jerry was quite impressed when he saw a Lowe’s, a Home Depot, an Ace Hardware and a Walmart saying he could possibly live there! The tale of the London Bridge of course began in London where after many years the bridge was deteriorating. It was narrow and decrepit, it blocked river traffic and it also began to sink. By 1924, the east side of the bridge was three to four inches lower than the west side so in 1967 the Common Council of the City of London placed the bridge on the auction block and began to look for potential buyers. The winning bid of $2,460,000 went to Lake Havasu City founder, Robert McCullough who was also the inventor of the McCullough Chain Saw. The bridge was dismantled, block by block and numbered so that it could be reassembled just as the original. The blocks were then shipped to the Panama Canal, then to California and then trucked to Long Beach and then Arizona where it was reassembled. The total cost of the bridge was $5.1 million and it took 3 years to reassemble it. Of course our first stop was the Visitor’s Center. We entered through the gate, a part of Witley Court in in Worcester, England. Although Witley Court was remodeled as an Italianate palace for the Earl of Dudley in the 19th century. Following a fire in 1937 it changed hands several times and eventually everything of value was sold. Robert McCulloch bought one of the gates and had it shipped to Havasu City. After entering the gate we immediately saw a lovely fountain. It was built in 1999 with stones from Mexico and the lions on the edges from a landscape company in Las Vegas. Although beautiful the fountain has nothing to do with the London Bridge but it surely is pretty and sets the scene. After getting some advice from the Visitor’s Center we wandered around the courtyard. We could walk to the waterside and actually walk under the first arch of the bridge. After wandering around for a bit we got in the car and rode to the beginning of the bike trail. We sat in the car, had our picnic lunch and then started our ride. Rather than go immediately to the bike path we rode over to London Bridge Park. What a lovely place. We rode the bikes as far as we could and then continued on to the bike path which was 3 ½ miles long. It was a good ride, good exercise and a great place to safely ride the bikes. We figured up that we rode a total of about 6 miles! After the bike ride we retraced our bike ride and stopped to look at a couple of the 26 lighthouse replicas along the way. There are two from North Carolina, Cape Hatteras and Currituck Beach but we didn’t get to see either of them. Next we headed back to the Visitor’s Center. Of course I bought a magnet and then we wandered around the area some more looking at the various shops. Naturally we ended up at the ice cream shop and then enjoyed the cool shade of the bridge while we ate the delicious ice cream. There is a statue of Robert McCullough but it is at the top of the bridge and at the top of A LOT of stairs so we elected just to see it from below. 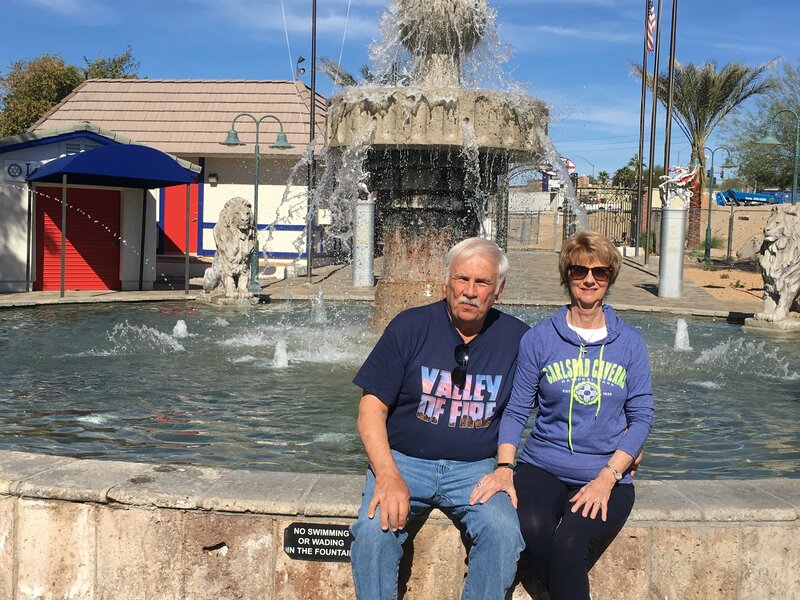 A stop at Walmart and then we were headed back to Needles, California. As we entered California we had to stop at an inspection center. 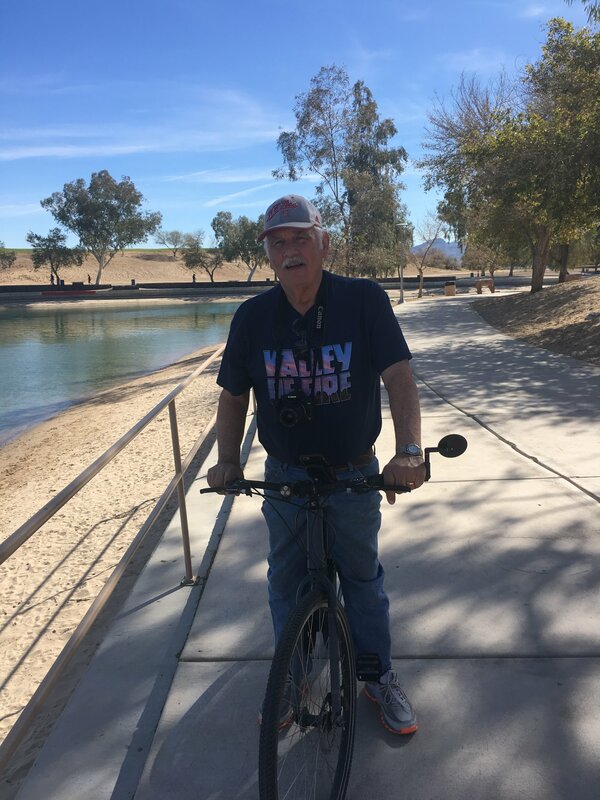 We were asked where we came from and Jerry told him North Carolina and then I explained that we were staying in Needles and had been to Lake Havasu City for the day. He asked if we had any plants and sent us on our way. I finally got my Welcome to California picture. Once we got back to the campground we immediately hooked the car up so we’ll be ready in the morning. We stayed outside and chatted with Roger and Norma for a while and then had a wonderful dinner of barbecue chicken, the best meal we’ve had since we’ve been on the road (or at least it was to me)!